Is StbMegaMillionChoices a Scam or Legit? Read Reviews! If you’re looking for an out of the box lottery game to play, 2018 Mega Millions Choices Lottery might be what you’re looking for. This game was established by St. Boniface Hospital in Manitoba, Canada. There is a really good list of prizes starting with their early bird draws through to their main prizes. The only downside is, you’ve got to be there to purchase tickets. Want to know more? The next St B Lottery kicks off on the 8th of January 2018. Tickets are available from then through the 22nd of March 2018. Getting in early is important if you want to take advantage of the early bird draws and other benefits. The 2018 game’s prize levels aren’t posted yet, but looking at 2017, wow! The main prize was a custom home (four options to choose from) in Winnipeg or Arizona or CDN $1,100,000. Add to that the 50/50 plus draw though this means investing a bit more into tickets with the winner getting 50% of revenue (that’s gross) up to CDN $750,000. Big Score Plus is another side game up to a maximum of 83,000 tickets sold. This is for 25 daily draws, 8 Fridays and one big “Ultimate Draw” for a share in CDN $145,500. Add to this the daily prize option of an NHL Travel Package for two regular season game tickets including airfares, hotel and a few other things. The alternative is a vacation travel voucher from River East Travel – or cash. I’m still not sure where the “Dufresne Gift Card” factors in but it is yet another prize offered. That will be the interesting thing once they release the 2018 prizes as it seems this is a charity lottery with lots of surprises. Winners have 60 days from any draw dates to claim their prizes otherwise you automatically opt for the cash prize. They say they will send out a cheque by snail mail at the same time they also say all unclaimed prizes revert back to the foundation three months after notification to the winner. Oh – and you can only win one prize in each category. 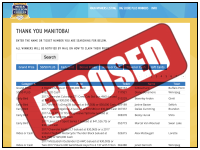 Sorry folks – though non-residents of Manitoba can play, tickets must be purchased in person in Manitoba, Canada. There is a list of locations, plus purchasing can be done online, but you’ve got to actually be physically there. All prizes are tax free though you might have to check with your accountant if you’re a non-resident of Manitoba for local taxes. For Canadians, ticket purchases are not tax deductible even though this is for a charity. Who Is St B Lottery? StbMegaMillionChoices.ca is operated by the St. Boniface Hospital Foundation located in Manitoba, Canada. They have a snail mail address, email address, phone numbers and a fax number (do people still use those). Emailing them gets a quick answer. Would you mind rating StbMegaMillionChoices.com? All in all, this is a lovely lottery that helps a good cause – a hospital – and provides people with a chance to win some great prizes. The only downside is the fact you have to actually be in Manitoba to buy your tickets. That is, unless you’ve got a good friend there that can do it for you. Even purchasing online, you’ve got to be there. St B Lottery gets a thumb’s up. I really like these cause related lotteries. The prizes are usually unique and it will be interesting to see what they come out with in January 2018 for the latest list. Save that date so you can check it out.